35 qt. Bucket with Bilingual Caution Sign. This plastic bucket accepts a squeeze wringer http://clickjanisupply.com/side-press-squeeze-wringerside-press-squeeze-wringer, and features molded-in graduations make it easy to fill and mix accurately. 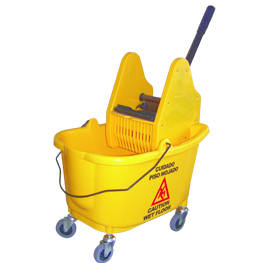 Includes Chrome Handle and 3" Casters, and has an elevated bucket ledge to easily accomodate a wringer. Bucket has Bold Spanish/English CAUTION message on the sides.